We have the opportunity to show an outstanding selection, including paintings by Nicolas and Gaspard Poussin, and some of the Dutch Poussinistes who were so enthusiastic about the appeal of the Italian pastoral landscape. Domenichino is the very first of Annibale Carracci’s pupils to take up this genre, for which he became famous already in his own time. The panel in the show is unpublished, but corresponds precisely with other examples that are documented and painted in the first year of his arrival in Rome, 1602/03, taking the new idea of figure subjects in a landscape setting that was to prove so successful. Landscape painting was a speciality that was done by many painters early in their careers, as it was not regarded as challenging a subject as figure painting: but it was very popular especially abroad as French, English and German painters came to Rome to learn the profession. 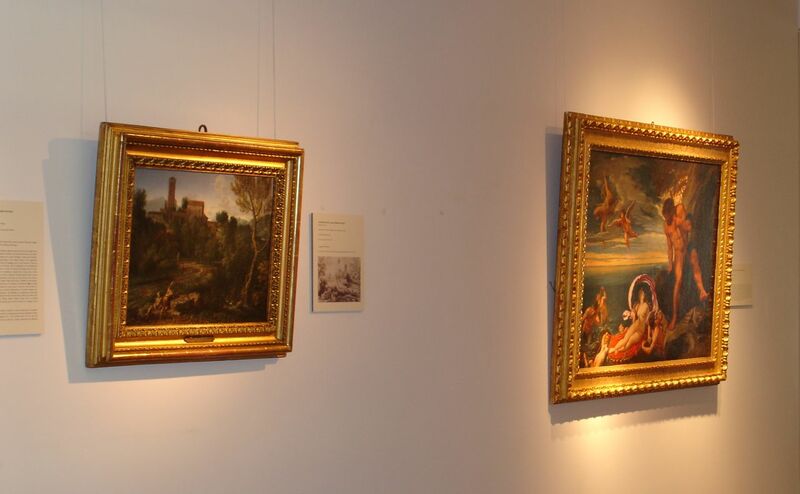 In the show there are two intimate works by Nicolas Poussin, done around the middle of the century for Carlo Antonio Dal Pozzo, which were especially relevant for visitors to the city to admire, because nearly all his larger landscapes had all been sent away to Paris. The three works by Gaspard Dughet, Poussin’s brother-in-law, are great examples of the tradition that was even more popular in the eighteenth century, when every English country house seems to have had a pair hanging either side of the fireplace. The Italian landscape is also the territory that Claude-Joseph Vernet made so familiar, after his long stay in Rome and Naples in the 1740s, and the exhibition includes no less than four works by this great artist, including the first version of the View in the Gardens of the Vi!a Ludovisi that was done for the Marquis de la Villette and is now in the Hermitage. The painting has the artist’s self-portrait, with his wife, against the backdrop of the Casino Del Monte, with visitors getting soaked by the hidden fountains, a practical joke that Cardinal Del Monte and Cardinal Ludovisi enjoyed and which was a famous feature in the gardens there. There are three other later landscapes by Vernet in the show, magnificent examples of what was the height of fashion in the 1770s.